This recipe was a spin on one of my favourite recipes from skinnytaste.com, Roasted Potatoes, Chicken Sausage and Peppers. 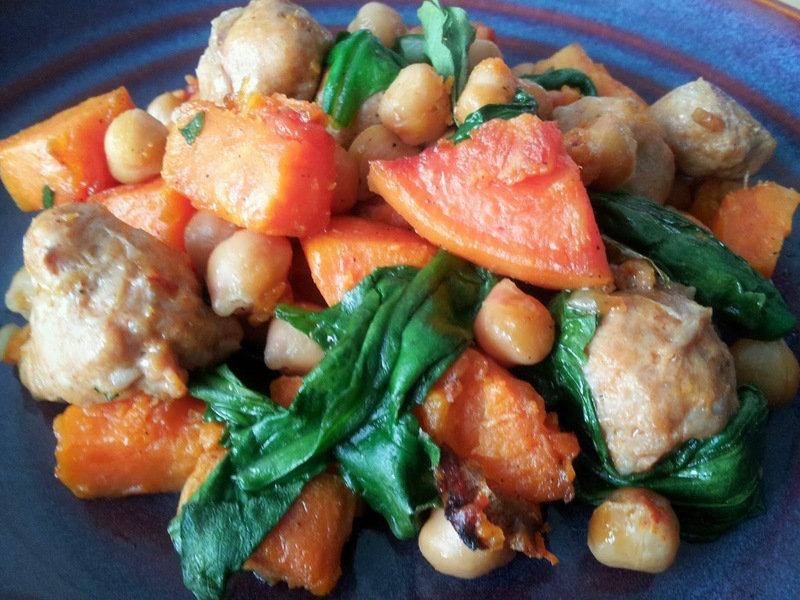 I decided to try it with sweet potatoes instead and I used pork sausage, but you can use any type you prefer. This recipe reheats well, so you can make extra and pack it for lunch the next day. Preheat oven to 375 degrees F. Grease one large roasting pan (or 2 smaller ones) with canola spray. Add chopped sweet potatoes and shallots into a large mixing bowl and drizzle olive oil on top. Add black pepper and toss to coat. Pour potatoes and shallots into roasting pan and spread evenly. Do not crowd the pan. While potatoes are cooking, slice sausage links into bite sized chunks and drain chickpeas. Remove the pan from the oven after 30 minutes, toss the potatoes, and quickly add sausage and chickpeas. Return to oven for 15 more 15 minutes, then remove. Add spinach on top and return to oven for 15 minutes more (total roasting time is 60 minutes).